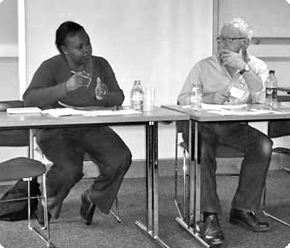 The Africa: Cultural Translations Conference took place from 21-22 May 2010 at Lancaster University. It was organised by Lancaster University African Studies Group in association with the Centre for Transcultural Writing and Research. One of the main events on the afternoon of the first day way a reading by Goretti Kyomuhendo and a discussion with Graham Mort in the Chair. Goretti Kyomuhendo was born in 1965 and grew up in Hoima, western Uganda. She currently lives in London. She holds an MA in creative writing from the University of KwaZulu-Natal, Durban, South Africa. She is a founding member of FEMRITE – The Ugandan Women Writers’ Association and Publishing House, and worked as its first Programmes Coordinator for ten years (1997-2007). She has been commissioned to undertake several writing consultancies including by UNICEF, to develop a script for a multi-media package, based on children in conflict situations, which was later published as an illustrated comic book entitled Sara and the Boy Soldier, in 2000. Here first novel, The First Daughter, was published in Uganda in 1996. Secrets no More followed in 1999, and it won the Uganda National Literary Award for best novel of the year in the same year. In 2002, she published a novella entitled Whispers from Vera, which was serialised in The Monitor, the Ugandan based newspaper. Her most recent novel is Waiting, published by The Feminist Press in New York in 2007. She is currently working on a novel on the theme of Immigration.